Franskene ved, at vin og ost er lavet til hinanden. Behandl dine smagsløg til denne perfekte parring ved en specialkremkælder under Paris 'gader. Smag syv forskellige franske og schweiziske oste ledsaget af vin udvalgt til at supplere de gamle smag, plus bid af baguette og frisk frugt. En professionel cheesemonger vil lede dig gennem prøvesmagningen. Gruppens størrelse er begrænset til 10 for en mere personlig kulinarisk oplevelse. Bid til historien om fransk ostemaking på denne unikke madtur i Paris. Gør din vej til en special ost stop i 3. arrondissement, hvor du vil møde din cheesemonger guide. Don en beskyttelsesdragt designet til at bevare de delikate oste og ned i en kølig kælder fyldt med modningsblokke, ruller og hjul - nogle så store som 77 pund (35 kg). Lær om den traditionelle ostevoksende kunst og vigtigheden af ​​modningsprocessen, da du beundrer kælderens forsyning. Smag syv forskellige sorter skåret frisk fra blokken, som schweizisk Gruyère, bôfavre (en hård ost fra Schweiz Jura-bjergene), delikat Camembert, Etivaz (en hård ost med oprindelse i Alperne) og Beaufort (en rå koemælkost). Alternativ bid af duftende fraage med sip af fantastisk fransk vin parret til supplerende smag. Også nibble på friske baguetter og frugt for at fuldføre din gourmetsmagning oplevelse. Efter 1,5 timer i kælderen, dukker op igen på gaderne i Paris som en nyvinderet vin og ostfisker! 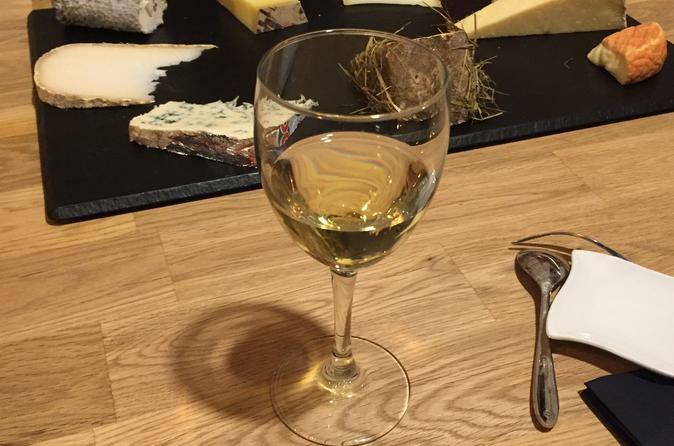 The cheese and wine tasting was one of the highlights of our stay in Paris. Our host spoke very fluent English. He was very personable and very knowledgeable about the different kinds of cheeses throughout France. I would highly recommend this tour. Delicious and fun experience. Learned a lot about cheese! The wine and cheeses were EXCELLENT, and the young lady guide was so nice, we thanked her for such a wonderful afternoon in our first day in Paris! This was a great experience! Learned a lot and really enjoyed it. Our guide, Caroline, was wonderful. Her knowledge of the cheese making and aging process was a great learning experience. She took the time to teach us how to taste the cheese on its own, and then how to really enjoy the cheese with the wine. Coming from the United States where everything is pasteurized, even the cheese, we really enjoyed tasting the different layer of flavors in the cheese, and wine. We came away with a great appreciation of the cheese making process. Enjoyed every minute of it. Our tour guide was wonderful!! I tried writing a review just after our tour in September but the link did not work! We have been to Paris 8 times and had other cheese tours but there is something special about being in a cheese cellar that added to the experience. The shop was excellent along with the cheeses!! We learned so much!! We arrived on a Thursday morning and did this tour that afternoon. Even as jet-lagged as we were, the Metro was easy to navigate, and Paroles de Fromagers the language of cheese, I think shop was easy to find. Our guide was Caroline, an utterly charming young woman with an encyclopedic knowledge of cheese and wine, who proceeded to introduce us to an entirely unknown world of cheese, what it is and how to appreciate it. This tour was terrific! I brought back about a pound of cantel cheese a new discovery to me and I'll be really sorry when it's gone! At the end of our tour, we actually got treated to an impromptu butter tasting. Nearly a dozen different artisanal butters, fresh churned with different spice mixes. The maple pepper was my favorite. Merci beaucoup, Caroline! Excellent presentation by cheese monger who really knows and LOVES her cheese. 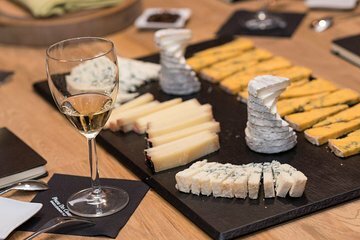 Sufficient selection and education about cheeses and their pairings with wine. Our complaint and that of those who shared this experience with us is that the wine pours were miniscule, providing no more than a literal sip or two. When one of the participants asked for a little more to taste with her final cheese, she was told the wine tasting portion is over and her request was declined although there was an open bottle sitting by the presenter. It felt like a cheesy move if you'll pardon the pun for an expensive and otherwise excellent experience. Very good workshop where we could learn how to properly try various cheese pairing with wines. Pierre is fantastic and told us all we needed to know about French cheeses and wines. We learned a lot about this typical French food. Definitely a must! Great cheese tutorial and fantastic guide who truly loved her work. Very educational and a fun excursion like none I'd done before. Much more about the cheese than the wine.